Ned Herrmann is an educator who has developed models of brain activity and integrated them into teaching and management training. The brain is made of approximately 100 billion nerve cells, called neurons, have the amazing ability to gather and transmit electrochemical signals, think of them like the gates and wires in a computer. Nerve fibres share the same characteristics and have the same makeup as other cells, but the electrochemical aspect lets them transmit signals over long distances (up to several feet or a few meters) and send messages to each other. ➜ Neurons: Messenger cells in your nervous system. ➜ Nerve impulses: Electrical signals carrying messages. ➜ Neurotransmitters: Chemicals released by one neuron to excite a neighbouring one. ➜ dendrites – fibres that carry information towards the cell body. ➜ Sensory neurons carry signals from the outer parts of your body (periphery) into the central nervous system. ➜ Motor neurons (motoneurons) carry signals from the central nervous system to the outer parts (muscles, skin, glands) of your body. ➜ Interneurons connect various neurons within the brain and spinal cord. For example the motor neuron. It has a nucleus (the central part of an atom, it contains protons and neutrons) surrounded by cytoplasm. The cytoplasm forms a long fibre that is surrounded by a cell membrane. This is called an axon. The axon carries the electrical impulse and is protected by a fatty sheath (a bit like the plastic coating around an electrical wire). The fatty sheath increases the speed at which the nerve impulse is transmitted. The nerve ending is branched to make good contact with other neurons or the effector organ. 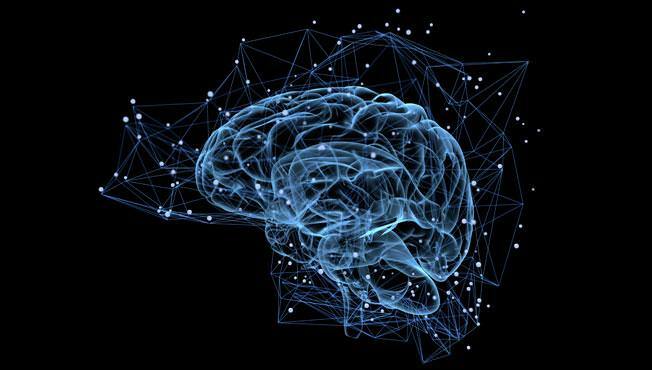 It is well known that the brain is an electrochemical organ, researchers have speculated that a fully functioning brain can generate as much as 10 watts of electrical power. At the root of all our thoughts, emotions and behaviors is the communication between neurons within our brains. Brainwaves are produced by synchronized electrical pulses from masses of neurons communicating with each other. There are five categories of these brainwaves, ranging from the most activity to the least activity. Most of our lives are spent in this type of brain wave, which is also why abnormalities in beta waves can be linked to various mental illnesses. These waves are indicative of normal activity in the brain when we are conscious and alert. Is a ‘fast’ activity, present when we are alert, attentive, engaged in problem solving, judgment, decision making, or focused mental activity. Individuals lacking beta wave activity can experience depression and ADHD. Lower brain activity can make it hard for individuals to focus and engage with the surrounding environment, which has a direct impact on mood. However, individuals with stronger than average beta wave activity can likely experience stress, anxiety, and insomnia. Insomnia is particularly interesting because it also has a relationship with a number of alpha waves. Beta wave oscillations are present in patients with Parkinson’s disease, and research is currently being done to explore this correlation. Some hypotheses are trying to manipulate deep brain stimulation in order to regulate beta waves in cortical areas that are most commonly effected by Parkinson’s. In clinical trials, the regulation of beta waves has been shown to decrease the symptomatic tremors that are characteristic of the disease. Are seen when not much information processing is required. Most often, these waves are present just before an individual drifts into sleep, or just as they are waking up in the morning. Interestingly, the moment that an individual closes their eyes, the brain begins to produce more alpha waves. This can be tied to the change in light exposure to the brain through the eyes, as well as the evidence for why humans sleep when the sun goes down. Alpha waves and insomnia, can be partially explained by the lower conductance of alpha waves in a brain that experiences insomnia. Higher beta waves make it harder for an individual to get to a relaxed state, and low alpha waves also make drifting off into sleep more difficult. Are most often seen during light sleep and REM (Rapid Eye Movement) sleep when the eyes switch back and forth. Can also be present during extreme relaxation, or in a suggestible hypnotic state. Are also extremely important in memory consolidation. When asleep, or in a twilight state, our body no longer processes outer stimuli and instead changes gears to maintain vital bodily functions. Occur in very deep, dreamless sleep. When experiencing delta waves, you are completely unconscious. 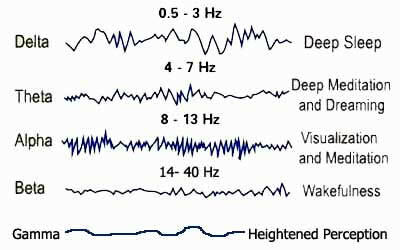 When dominant, these waves outline a state in which the body is able to recover from activities of the previous day. Essentially, the body is taking advantage of this low activity in order to reset and prepare for the coming day. Healing and regeneration are stimulated in this state, and that is why deep restorative sleep is so essential to the healing process. If not experiencing enough time in a sleep on delta waves, accounts for feeling tired the following day or days. Are the fastest of brain waves and relate to simultaneous processing of information from different brain areas. The most subtle of the brainwave frequencies, the mind has to be quiet to access gamma. Was dismissed as ‘spare brain noise’ until researchers discovered it was highly active when in states of universal love, altruism, and the ‘higher virtues’. According to neuroscientists, analyzing electroencephalograms of people submitted to tests in order to research the effect of decreasing the brain rhythm, the attentive relaxation or the deep relaxation, produce significant increases in the levels of beta-endorphin, norepinephrine and dopamine, linked to feelings of enlarged mental clarity and formation of remembrances, and that this effect lasts for hours and even days. Companies and composers have begun using software to make music customized to your brainwaves. There are two general types of brainwave entertainment frequencies available in the market today: Binaural Beats and Pulsed Tones (aka Isochronic tones). 1) Binaural beats often require expensive headphones for maximum benefits. Pulsed tones do not. In fact, isochronic tones often do not require any headphones at all. 2) Binaural beats tend to stop working for a person after a while, so they are required to purchase new tracks with deeper binaural entrainment frequencies.Pulsed tones don’t stop working in this way, and they actually work better the more one uses them. This is because binaural beats send two different frequencies at barely-audible volume levels into each ear. It is then up to your brain to “do the math” and entrain to the difference of the two frequencies. For example, one ear receives a tone at 200hz, and the other ear receives a tone at 210hz. Your brain will then (theoretically) entrain to a 10hz rhythm, which corresponds to a deeply relaxed Alpha state. The problem is that over time your brain gets used to processing the two tones and stops entraining to the difference. This is why most binaural beat brain entrainment products have several levels to keep your brain progressing as it adapts to the frequencies. Isochronic tones, on the other hand, present the brain with a computer generated, audible rhythmic tone that the brain will easily follow. The brain’s natural tendency to follow, or entrain to, rhythmic tones allow isochronic tones to create a powerful, consistent state of entrainment that does not “wear off” over time. continue reading at Craig Freudenrich.How Nerves Work and Olav Krigolson.What Are Brain Waves?